Ninety-six percent of water on earth is saline. All of it is saline. We cannot drink salt water. Aquifers make up thirty percent of the four percent that is fresh water. Beneath the putrid oil wells of the Texas panhandle. California almonds drink this water when people cannot. Nestlé bottles what the people may not drink. Is the same as the amount that could supply all the world’s people. Japan had 23 golf courses before World War II. And built three thousand courses. Lake Huron is the third largest fresh water lake on earth. Started using Flint River water instead. (It takes its name from the Ojibwe language, when the river ran pure). That leached lead from the pipes in lethal doses. Water brought rashes and pain to their bleeding skin. Sixty percent of the human body is water. We humans need water more than we need food. Why do capitalist private profiteers get to drain our aquifers? Flint is a lesson and a call to wake up. Preys upon the lives of our people. The deadly lung disease silicosis is caused when miners, sandblasters, and foundry and tunnel workers inhale fine particles of silica dust—a mineral found in sand, quartz, and granite. In 1935, approximately 1,500 workers—largely African Americans who had come north to find work—were killed by exposure to silica dust while building a tunnel in Gauley Bridge, West Virginia. Ordinarily, silicosis takes a several years to develop, but these West Virginia tunnel workers were falling ill in a matter of months because of exposure to unusually high concentrations of silica dust. The crisis over silicosis suddenly became a national issue, as seen in this article in the radical newspaper Peoples’ Press. In 1936 congressional hearings on the Gauley Bridge disaster, it was revealed that company officials and engineers wore masks to protect themselves when they visited the tunnel, but they failed to provide masks for the tunnelers themselves, even when the workers requested them. 1500 Doomed in W. Va.
Their only gravestones [are] cornstalks waving in the wind, their shrouds [are] the overalls in which they died, 169 tunnel workers killed at Gauley Bridge were tossed into trenches in this field at Summerville, W. Va., to rot. As they keeled over in the death tunnel, one at a time or several in a day, choked to death by silicosis, they were hauled 40 miles to Summerville and dumped into the grave the same day. No identification, no coffins. The company paid the undertaker $50 a piece to bury them. A wife who came tearfully to claim the remains of her loved one was quietly driven away. There was no way in which his body could be found. They were all victims of America’s worst industrial disaster. Then government officials, newspapers and others conspired to keep this story from the public knowing that soon the witnesses would all be dead. The 26 foremen are already dead. In Gauley Bridge, Town of the Living Dead, men once strong and hearty waste away while loved ones grimly await their death. Gauley Bridge, W. Va.—America’s greatest industrial catastrophe has been hidden from the public. There are 476 known dead. There are nearly 1,500 doomed to die. Of these 200 are believed already dead. Daily they cough their lives away, their lungs clog, they grow weaker. Finally they fall. Gauley Bridge, the Town of the Living Dead, shrinks a bit and hurries on. For practically every man in the whole community is doomed to a death like that. 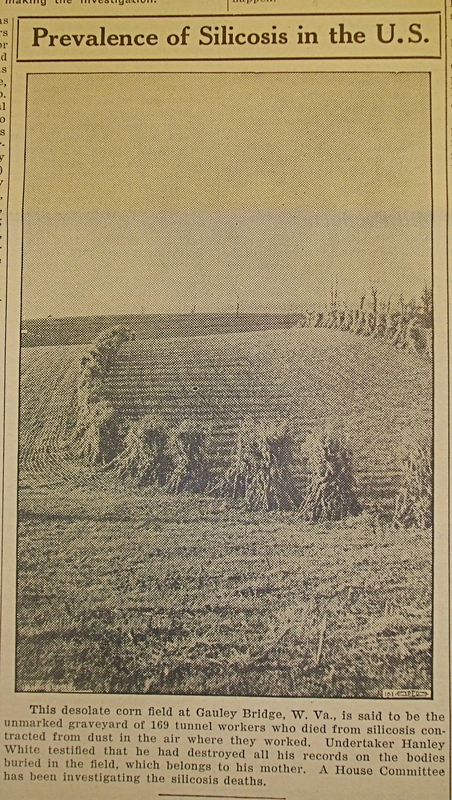 In one cornfield, 169 bodies have been tossed, unmarked. One doctor has treated 307 other men. They’re dead. Some 200 have written desperate letters from other cities—and then have stopped writing! Desperately, the corporation whose tunnel job caused this holocaust has tried to keep the facts from the public until the last witness was gone. That will not be long. Already all of the 26 foremen are dead. Mrs. S. E. Harrah sent a two-line item to the county seat paper about ambulances—and her husband was fired. He son, a lawyer, investigated, talked suits. Not any more. Last September he died suddenly. “Heart failure,” they called it. Mrs. Charles Jones brought suits. Her son, Shirley, 18, was the first to die. Then his brother Owen, 21, died. Then their brother, Cecil, 23. Then an adopted son, Oley Jeffrey. Then Mrs. Jones’ brother. She has lived through this horror to see her husband wither before her eyes. Once he weighed 182. Now he weighs 126. He will read his story; we draw the curtain here. All this because a rich and powerful corporation valued dollars above lives. When the Rinehart & Dennis, Co., contractors for the New-Kanawha Power Co., started tunneling through two mountains a mile east of Gauley Bridge, on a power project to cost millions, it knew the tunnel would go through silicate rock. It knew that men working in the tunnel would breathe in the dust. It knew that without protection they would get silicosis, deadly lung disease. Behind Rinehart & Dennis was the New-Kanawha Power Co., set to build the tunnel, dissolved as soon as the tunnel was completed late in 1934. 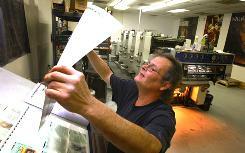 Behind the New-Kanawha Power Co. is the Electro Metallurgical Co. This is the big company that will use and sell the New Kanawha power. Behind the Electro Metallurgical Co. is the Union Carbide & Chemical Co., gigantic company spreading into many fields. Power to be won from the mountains and the rivers of West Virginia was behind the building of the tunnel at Hawk’s Nest, near Gauley Bridge. Dams, powerhouses, and a tunnel through the mountains to increase the drop in the New River and the force of the water power—a huge project, with huge profits to be made, from the power and the enormous silicate deposits. A huge project, started in 1926, not yet completed, though the death tunnel is done. Millions have been spent—$20,000,000 already. Four years ago, preliminary work done, the tunnel was started. Engineers of the company had made tests. The mountains were full of silicate rock. Silicate—valuable, deadly if breathed into the lungs in large amounts. No complete protection against silicate was known, when very fine, as in this case. But there were masks that helped. Ventilation shafts would carry some of the dust away. These would cost a few thousand dollars, in the $20,000,000 project. Should Rinehart & Dennis order the masks, the shafts? The men who own the Electro Metallurgical Co. did not go into the tunnel. They did not see the fine particles of dust, so penetrating that a 48-ton locomotive with headlights on could not be seen five feet away. Not to buy masks, not to put in air shafts or any other ventilation. Some 2,000 men worked in the tunnel, 400 to 1,100 at a time. They got 25 to 30¢ an hour and worked 12 hours a day. They are all dead, dying or doomed to death. Shirley Jones was the first to die. He was 18, thrilled to get his first job, in love. Three dollars a day for 12 hours of hell in an airless tunnel filled with fine dust that kept you from breathing, that you might wash off your hands but would never wash out of your lungs. That’s what Shirley Jones found. Within three months, he was fighting for breath, fainting, going back to work and fainting again, shaken by agonizing pain in his chest. He was losing weight so rapidly his big bones were hardly covered. “Don’t know what’s wrong, honey,” he gasped now to his sweetheart. Finally he had to go to bed. One day he called his mother, Emma Jones, mother at 47 of so many children she had to count them to tell a stranger the number. “Mom,” Shirley gasped. “I don’t know what’s wrong but I’m a-goin’ to die. I think it’s from my work. I want you to have me cut open. If you can get anything from the company, go ahead. A few days later Shirley was dead. But pappy and the boys stayed in the tunnel. Three dollars, maybe $3.60, a day’s a lot around Gauley Bridge, and if you didn’t work for the company what could you do? The boys are dead—Owen, 21, Cecil, 23, the adopted boy, Oley Jeffrey. Owen died second; Cecil, who had a wife and two children, last. Silicosis kills the young first. Mrs. Jones’ brother Raymond Johnson is dead. Her husband still lives! 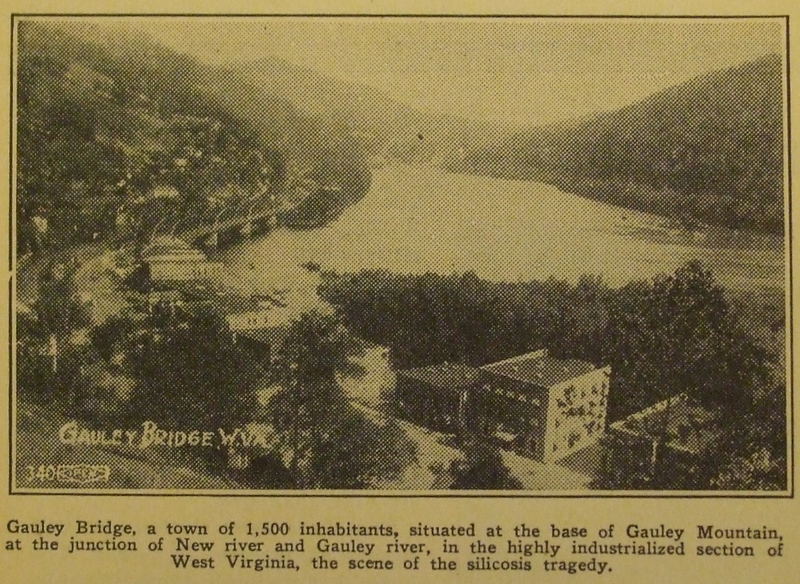 What Was Andrew Mellon Doing in Gauley Bridge in 1926? Watch the People’s Press for answers to these questions. In the name of greed, 476 men—at least—are dead. Another 1,500 are doomed of whom 200 probably are dead in other places. The dying are unable to get state or federal relief. The doomed who can still work cannot get jobs. Employers know they are doomed. The wives and children of the dead, the families of the dying and the doomed live at the edge of the starvation line. In the name of humanity, the People’s Press asks you to help them. Any sum, large or small, $100 or 1¢ will make life a little easier for this Town of the Living Dead. They will not get help from the millionaires who kill 2,000 men for a few dollars. That we know. So we urge you to help them. Everything given will go directly to these people in desperate need. 245 Seventh Avenue, New York City. Source: People’s Press, 7 December 1935. NARA, Record Group 174, Department of Labor, Sec. Frances Perkins, Labor Standards — Jan.-April 1936, Box 59. New Issue of Rethinking Schools: On Wisconsin! 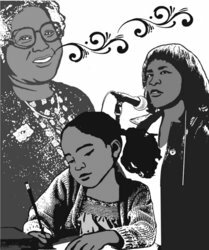 As a special introduction to our website, the text of the entire spring issue of Rethinking Schools is accessible here, free of charge. If you aren’t already a member of Rethinking Schools, we hope a look at the exciting and thought-provoking articles in this issue will inspire you to join. Educators need to begin to treat the climate crisis with the urgency it deserves as arguably the most significant threat to life on earth. In this issue of Rethinking Schools, we explore why there is so little teaching or discussion of climate change in classrooms and suggest paths forward. Myth Of American Primacy: How Does The US Compare With Other Countries? Just How Exceptional is the US? The New Year season is a good time to reflect on the U.S.’s true standing in the world. Politicians of every stripe ceaselessly repeat the well-worn clichés about America’s uniqueness and prowess at 4th of July, Memorial Day, election campaign and other patriotic celebrations. But how exceptional are we? The following list of some 35 categories compares our standing to other nations. Sadly, the five categories in which America ranks #1 are Military Expenditure, Incarceration, Marriage, Cosmetic Procedures and Obesity. China was divided into three regions (Shanghai, Hong Kong and Macao) and Shanghai and Hong Kong out-performed the U.S). China was divided into three regions (Shanghai, Hong Kong and Macao) and each out-performed the U.S. Please add you own categories and circulate. 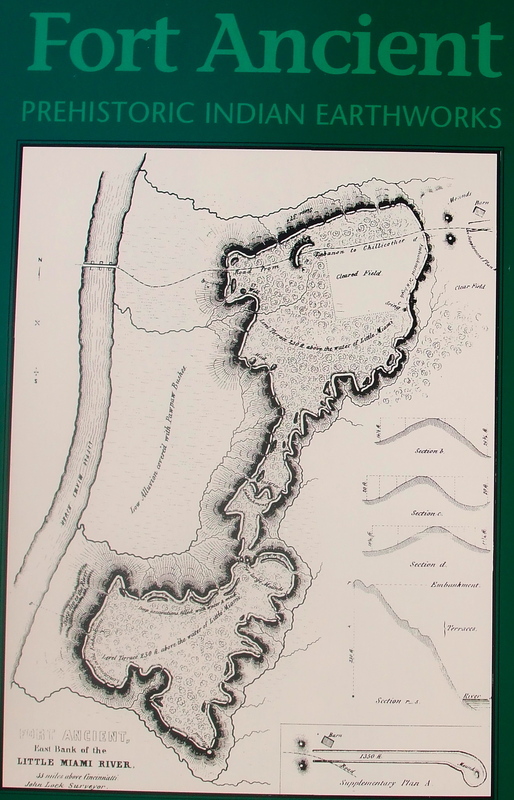 A map of the earthen walls on the bluff overlooking the Little Miami River at Fort Ancient. A year ago, when I first decided to go to my 50th high school reunion, I recognized that there was an element of nostalgia involved. I’m 67 now, almost 68 in fact, and I wonder what happened to those 50 years that intervened, when no one else in my high school annual has changed one iota. According to their pictures, that is, which remain frozen, unlike the change visible in my mirror daily. Who was I then, I wondered, and how did I become who I am today? With both Diana and me free to take a longer trip, I made some extensive plans to visit places we knew, as well as to explore places new to us. In retrospect, what happened was a quest for identity, but not, as might be gathered from the first paragraph, simply a personal identity. Here is what happened. In Southern Ohio, the Ohio River valley, native peoples built the epicenter of an extensive cultural network, beginning more than 2,000 years ago. From 200 BCE to about 600 CE, culturally related peoples we call “mound builders” ranged from as far north as what is now the Canadian border and upstate New York to Florida, west to Oklahoma and Minnesota. They appear to have lived in family groups of perhaps 50, often in semi-permanent, year-round locations for perhaps several years until resources such as fire-wood were exhausted. They did not depend on agriculture; instead they found abundant animal and vegetable food in the prairies and woodlands where they lived, only supplementing this primary food source with gardening. Diet seems to have been very good. Corn or maize was not a major source of calories for the Hopewell cultures of Southern Ohio, as they have been named (after the settler, Mordecai Hopewell, on whose property the first mound excavations were undertaken). Although many people lived into their 60’s, the average age appears to have been about 35 (many seem to have died in childhood or infancy). At Fort Ancient, people began building these earthen walls 2,000 years ago. Evidence seems to indicate that people spent relatively little time reproducing their means of survival. Leisure was a significant characteristic of their lifestyle. With their leisure, the Hopewell peoples learned much about their environment and built massive earthen architectural wonders that demonstrate this knowledge. In other words, they lived in small groups and had a relatively short life-span, still they surmounted these obstacles to build multi-generational, multi-family walls through which the people could read and celebrate the solstices and a complex 18.6 year lunar cycle. Within these walls, burial and ceremonial mounds were built, some as high as the mounds we have come to associate with Egyptians’ pyramids and Inca temples. The first archeologists called these earthen walls “forts.” Drawing on the experience of their own century, they believed the early peoples built these walls to protect them against their enemies. 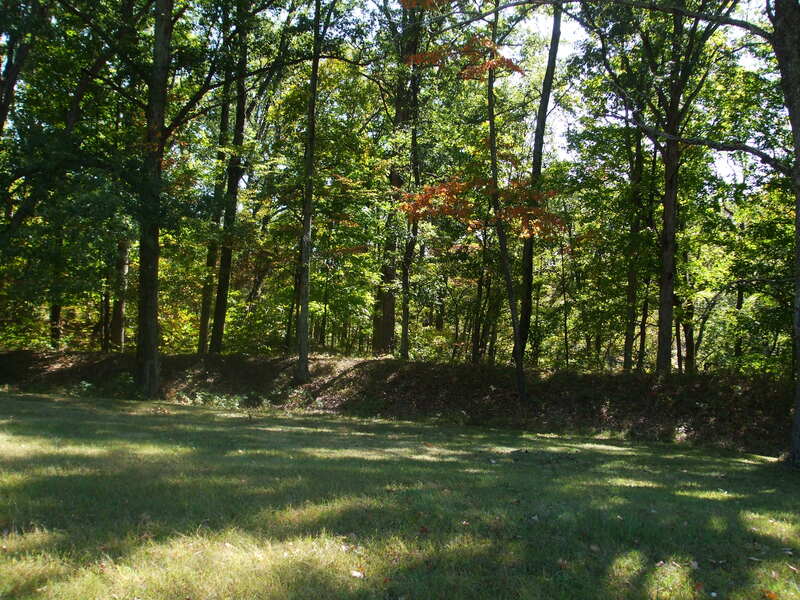 But they could not explain on this basis the many gaps in the walls surrounding “Fort Ancient.” This highest point in Southern Ohio lies on a plateau overlooking river valleys. 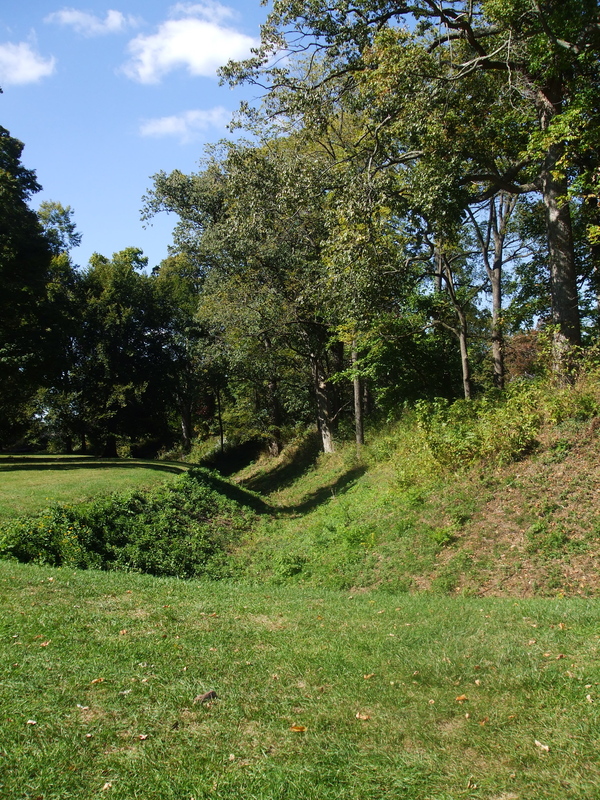 Here Hopewell peoples built walls along the perimeter of this bluff, several miles of earthen works 3 to 6 feet in height. Near the structure that now houses the Fort Ancient Museum are four small mounds. What distinguishes these otherwise nondescript mounds is that they are at the corners of a perfect square, 512 feet apart. From one of these mounds one can sight, through gaps, significant astronomical events, e.g. the setting solstice sun. This kind of formation is found elsewhere in Southern Ohio as well, hundreds of miles away, showing that the knowledge had been communicated throughout the area. Further, the amount of earth that was moved to create these mounds means a huge amount of surplus labor was available, more than any one group of 50 could muster, perhaps more than any multiple of groups of one generation could bring together. 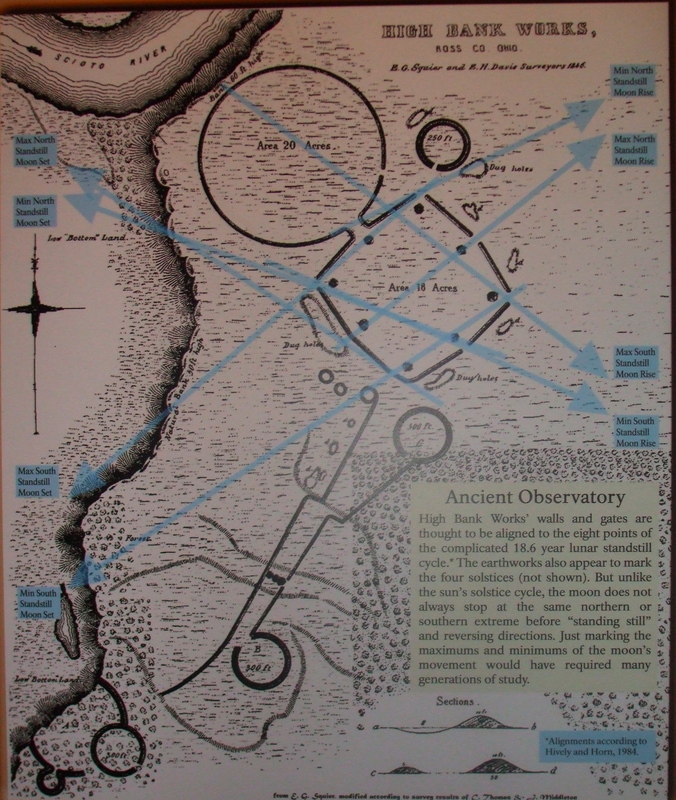 Map showing the geometrical formations aligned to astronomical events typical of a number of Hopewell sites. connected to the same astronomical observations. East of Columbus, at Newark, the “great circle” gives another example of the massive scale of the Hopewell ceremonial spaces, again a geometrically complex place only limited by the fact that a golf course now occupies the sacred ground of the square and smaller circles. This pooling of social labor and accumulation of empirical information required a highly complex social organization. And yet there is no indication that this complexity resulted in (or from) a need to defend themselves. There is no indication of enemies, no indication of warfare or weaponry (aside from the weaponry required for hunting food). The Hopewell legacy began to die out and was gone by about 600 CE. It disappeared. Only to be replaced around 500 years later by a culture that did have enemies, conducted some form of warfare, built stockades to protect themselves, and, perhaps most significantly, now subsisted on agriculture, primarily corn. Who were these new people? Were they really “new,” or did their life style gradually change to one which was more labor intensive, allowed for less leisure? Why did they abandon their ceremonial structures (the Great Serpent — the longest effigy mound, more than a quarter of a mile in length — lies near Peebles, Ohio)? There are no texts, no oral tradition to tell us. What we do know is that an economic revolution took place that was independent of anyone’s will, and that between 500 CE and 1200 CE native peoples crossed a chasm. It was the same leap that took place throughout the world, starting as early as 10,000 years ago, cultivating rice in Southeast Asia. This leap, this nodal point, describes the change between a cooperative society within which some hierarchy is evident without economic classes to a new, class driven hierarchy. While some societies survive today in this earlier stage, there is no evidence that societies that have made this leap have crossed the chasm back to an earlier stage. 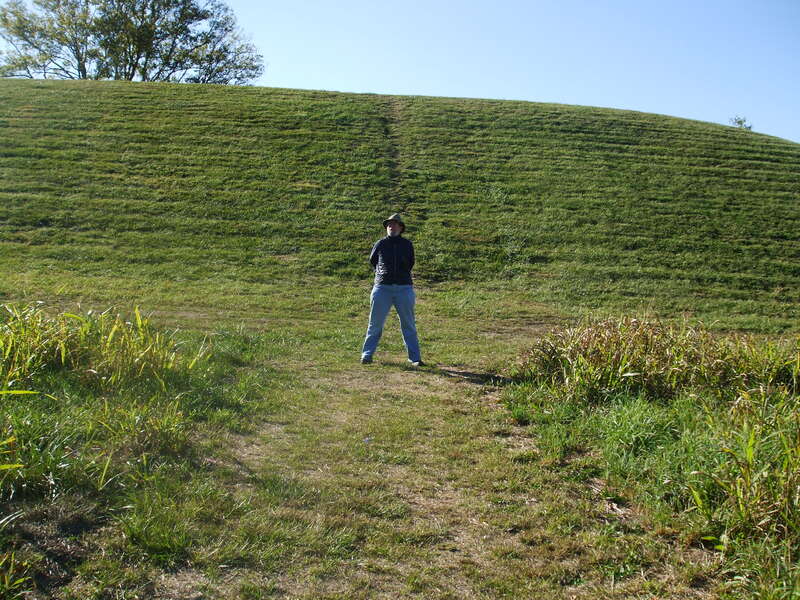 The Seip Mound, located near Chillicothe, Ohio, rises at least 30 feet in height and is part of a geometrical formation aligned to astronomical observation. There is a philosophical outlook — dialectics — that helps to explain this leap. Change takes place through uneven, back and forth motion that accumulates quantitatively until a point is reached, an eruption takes place, and the change that emerges is qualitative. Something new emerges, something that can not be stuffed back into the skin from where it came. structures, but motion to which we attribute characteristics similar to planetary relations, similar to nucleic acid structure. How then can dialectics go beyond metaphor to help explain the leap? The peoples who lived in the Americas 5,000 years ago were humans, of that there is no doubt, according to any scientific definition of our species. In that sense, I am identical with them, though my direct ancestry lies elsewhere. They are nevertheless my people; I claim them as my ancestors. What angers me is that I never learned about these remarkable peoples in school. I am outraged that my schooling took away my history from me. MY history is what I’ve lost. My journey to Southern Ohio was a quest to identify what makes me human, what is the essence of my humanity, what is not as immediate as my Eastern European ancestors who fled the Czar, but more fundamental to my presence on earth? Matsuo, Artist in Residence from Hiroshima. 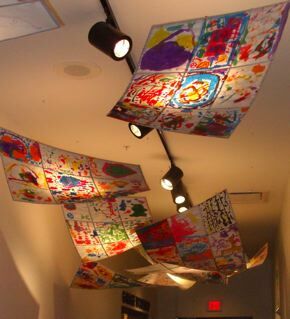 Matsuo worked with young children to produce floating panels, hung in a hallway, on the theme Remembering Hiroshima, Imagining Peace. We were fortunate to be accompanied by the artist, who completed the installation by inscribing, using traditional Japanese brush calligraphy, the character that represented her title for the exhibit: Harmony. Robin was one of the coordinators of a series of events remembering Hiroshima in Pittsburgh. One small exhibit at Carlow University included photographs of the devastation within a month following the bombing of both Hiroshima and Nagasaki. Also represented were puppets, sculpture, drawings by Pittsburgh artists responding to the devastation, condemning this chapter in our history. This devastation was barely 1400 years since Hopewell. Yet we who dropped the bombs are the same human species. How did we get this far from the cooperative society of that time? Who are we that we are capable of such contradictory activity? What is the dialectic that unites us? The easy way out is to blame this on Europeans, or the European influence, or racism. The reality is the Europeans crossed this same chasm only a few thousand years earlier; and their ancestors only a few thousand years before that in other parts of the world. The blink of an eye in the totality of our anthropological existence. The tools of destruction Hopewellians employed were limited to chipped flint, mined at a ridge not far from Newark, Ohio, and used widely throughout the Hopewell distribution. How did we get to tools of destruction not at all related to finding food? What leap got us to atomic weapons, where the photographic evidence confronting us showed humans evaporated from the intensity of heat? There were children destroyed in Hiroshima 55 years ago; today children in Pittsburgh “remembered” them with bright colors and pastels, a hope for a new harmony belied every day by American drones bombing Afghanistan, by Israeli bombs in Palestine, by the bombs of the powerful pounding the powerless. What do I identify with here? What is my identity in this mass of contradiction? Along the Finger Lakes, on the way up to the Adirondacks. 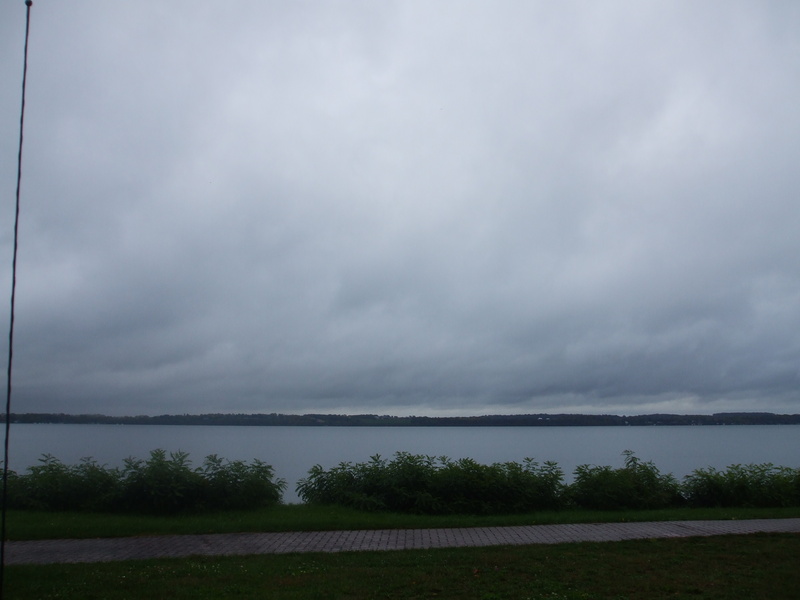 Leaving Pittsburgh, we drove north, in the rain, through Erie to Bath, along the finger lakes to Cranberry Lake, finally to Lake Placid. The home of the Winter Olympics in 1932 and 1980 is today a town filled with tourists and shops for them. Just south of the town is the John Brown Farm State Historic Site, some 240 acres purchased from Garret Smith, a wealthy New York merchant who was also an abolitionist. In 1849 John Brown moved his family to the vicinity, then called the Lake Elba area, on land provided by Smith to settle free blacks. Smith was fundamentally a Jeffersonian Democrat, who took the idea of the yeoman farmer seriously. He used his wealth to give free blacks an opportunity to own land. 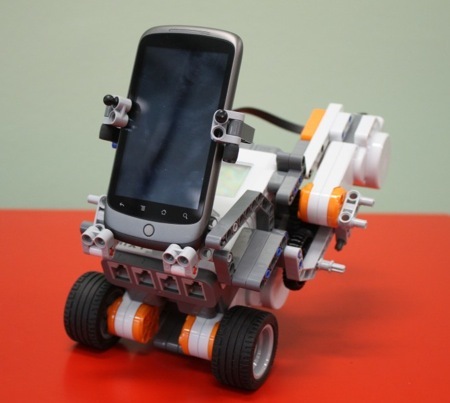 Smith called his project Timbuktu. 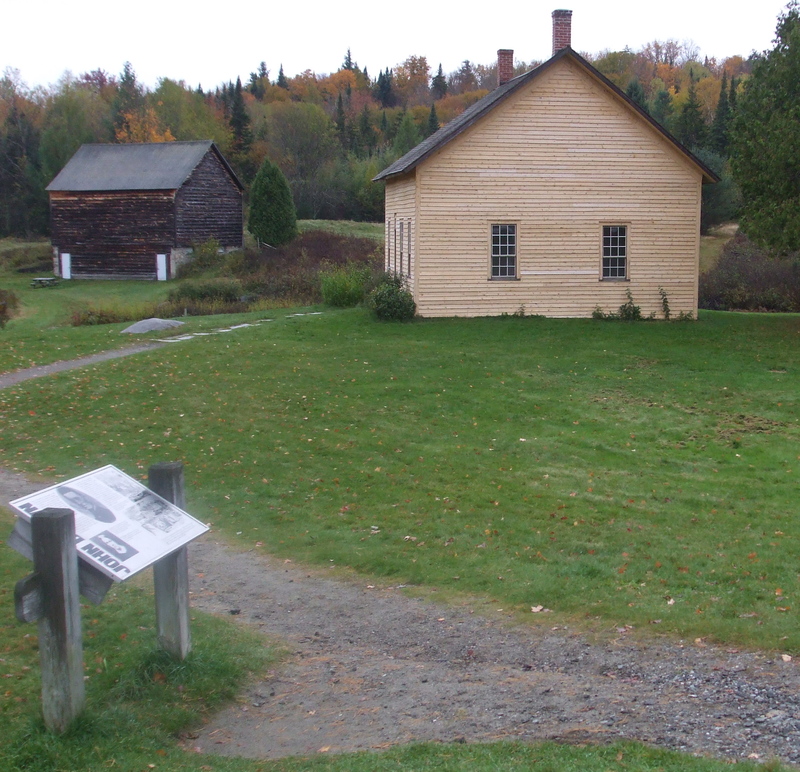 John Brown’s farm house, with the barn in the background. daughters on the farm, taking his sons with him to Kansas to insure that the territory entered the union as a free state. Once he left Kansas, he traveled the country raising money for the cause of abolition, a task which culminated for him when he and a group of followers seized the federal arsenal at Harper’s Ferry in 1859. Surrounded by federal troops led by General Robert E. Lee, Brown himself was badly wounded and many of his followers killed, including two of his sons. Brown survived long enough to be executed. From the time he left Lake Elba to the attack on Harper’s Ferry, John Brown visited his farm only seven times. Mary Brown and her daughters had help from the neighbors (certainly the families settled in Timbuktu — the name of one of these settlers, Lyman Epps is engraved in one of the ceiling beams in the original Brown house, which remains on the site). Life was exceedingly difficult in winters where the temperature reaches 30 below zero. the effects of which were mitigated by the assistance of neighbors. Running water was not available, the snow piles up in huge drifts, the wind sweeps off of White Face Mountain almost through the timbers of the houses themselves. It is difficult today to imagine the effort that it took to have enough wood around to boil the water needed to bake one or two loaves of bread daily and to provide the heat for the winter. One can see some evidence of it with stockpiles of wood next to Adirondack houses all along the way, none as much as would have been necessary to get through a winter then. With the growing season so short, the main crop was potatoes in 1849 to 1859, sold to the starch mill in town. Potatoes are still the main agricultural crop for any who choose to farm such an unyielding land. Of the original Timbuktu settlers, only one family lasted into the twentieth century. The Epps family survived because Lyman Epps did not depend solely on farming for his income: he taught voice lessons as well. The others left Lake Elba, driven away by their lack of experience (they were all city dwellers, unaccustomed to farming) and the difficult challenge the soil and climate presented any who dared to take it up. Imagine “Old Brown” — the road to the farm is “Old John Brown Road” — taking respite here after his war in Kansas; after strenuous journeys arguing here and there about the need to abolish slavery; coming back to Lake Elba, sitting at the large rock a hundred yards or so from his house (he called it his thinking rock), wondering where he could go next for support for his project; plotting his next steps toward the seizure of Harper’s Ferry; writing letters to those he hoped would support him in his endeavors; talking with his sons about what would follow Harper’s Ferry. 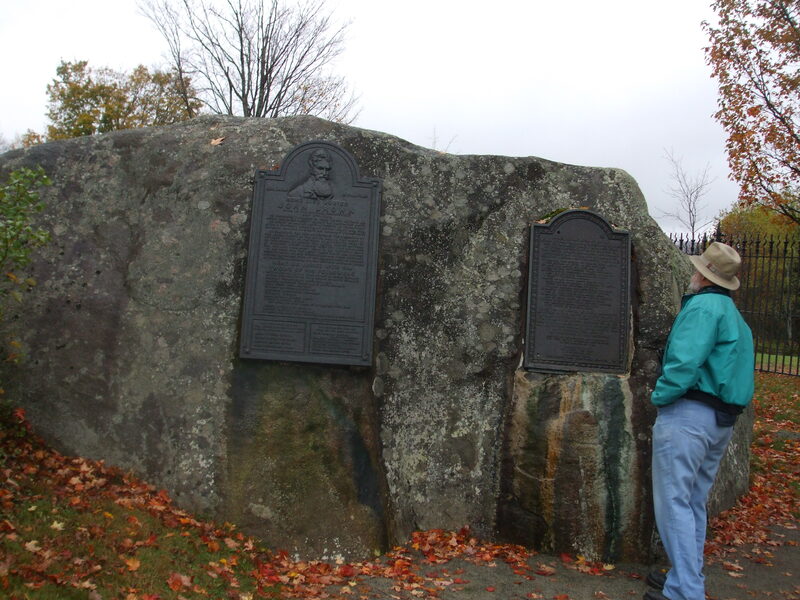 Two of John Brown’s sons were killed at Harpers Ferry. 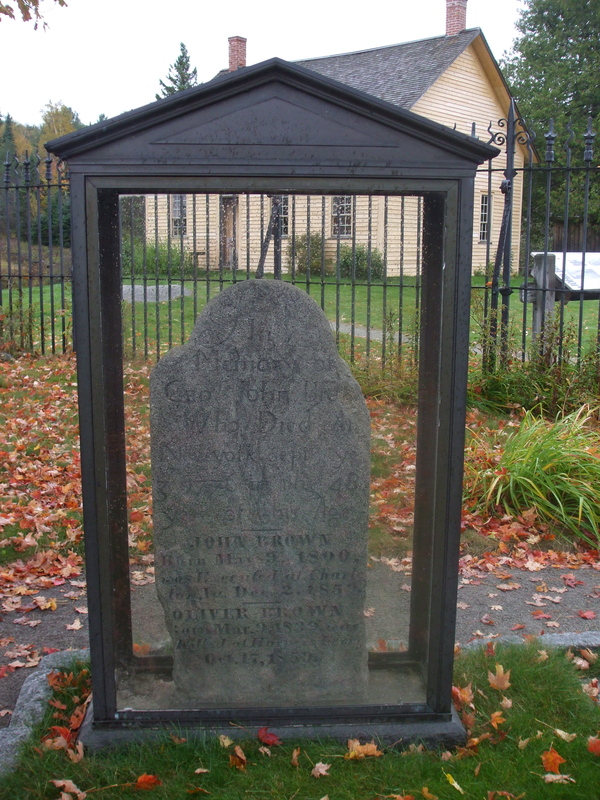 They are buried here with John Brown and the other martyrs of that battle. prophetic. This is not to say that the American Civil War ended racism or exploitation of ex-slaves. It did not initiate a paradise for workers. One cannot ignore, however, the historical consequence of the federal expropriation of the largest investment in private property in North America at the time: 4 million human chattel slaves. Standing at the grave site; standing next to John Brown’s thinking rock; standing in the farm house where Mary Brown and her daughters toiled those many years; I could only feel I was standing on sacred ground, sacred as any ground in the United States of America, sacred as the ground trod by the Stono rebels in South Carolina, 1739, more than a century before Brown was executed. Sacred, in its way, as the Hopewell ceremonial grounds. Here, after all, were buried martyrs who had struggled against an institution embedded in our history since 1619, codified in our own Constitution of 1789, and defended by our political leaders almost universally until the emancipation proclamation. This is, after all, the great cause, without the understanding of which the Mexican War, the Trail of Tears, and the Spanish American War are incomprehensible. If we hope to grasp our identity as Americans, we had better grapple with the contradictions that emerged as the American Civil War of 1861- 1877. The dialectics of the Civil War involve much more than the battle against slavery as such. For the end of the Civil War found Americans enslaved again — this time in a form of peonage called sharecropping in the South, now along with what workers in the North had come to call “wage slavery.” By the end of the century, with Wall Street clearly in control of the South, American finance capital had broken the back of Southern agriculture’s hold. To paraphrase the words of W.E.B. DuBois, Wall Street controlled the South and the South controlled the nation (on behalf of Wall Street). An economic revolution independent of the will of the American worker, slave, industrial capitalist, or slave-owner had swept across the country, driving all before it. The American landscape was fundamentally different afterwards. But not as fundamentally different as when the Hopewell “disappeared,” only to be replaced by an agricultural people. That was a world historic change from property in common to private property. The U.S. Civil War marked a change from one form of private property to another, a nodal point of a different kind, from one form of capitalist property in agriculture to another form under the heel of capitalist industry. How does this help me in my quest for identity? I stand on the hallowed ground of Lake Elba and sob for my ancestors who fought against slavery, ancestors from whom I am perhaps only slightly more directly descended than from my Hopwellian kin. I know my identity does not lie with “Old Brown’s” antagonists. Perhaps now, however, I can begin to parse the human identity that puzzles me about the chasm between people — whether between the Hopewell and their descendants or between the slaves and the slave-holders. What then is the meaning of identity? There is, of course, the question of who I am now versus who I was 50 years ago. Humans go through different stages of development in our lifetime. The riddle of the sphinx is one (physical) way of approaching this question: What animal walks on four legs in the morning, on two legs ant noon, and as night approaches walks on 3 legs? Of course this riddle has its mental or cultural equivalent (and can be related to our changes as a species as well). Seeing so many of my classmates from 50 years ago helped me again to appreciate the physical and cultural aspect of this riddle. We are not the same people we were 50 years ago. That is why I looked forward to this opportunity to apologize to one of my classmates for being such a beastly child. I was also eager to see how people had changed, who was doing what. I was not prepared for how few of my classmates I remembered at all. Which speaks to how isolated, how much of a recluse I was as a child. Much of what I knew as a child is now gone. Gone in the scheme of urban renewal foisted on New Haven by the Yale Corporation. Housing projects and “drug free zones” occupy the Shelton-Dixwell neighborhood in which I grew up. Newhall Street, which ran along the train tracks a couple of blocks from where I lived, demarcated black from white in those days. That boundary has been obliterated; last I saw it, the Stetson Library on the corner of Dixwell and Thompson had been abandoned. The house where I lived while in high school, on Chapel St. one house west of The (now Ella Grasso) Boulevard, is in disrepair along with the rest of the neighborhood. Further west on Chapel Street is Edgewood Ave. Park on one side, a forbidding marsh on the other, and then Yale Bowl, the citadel of Yale football. When I was 13 or 14 I walked to the Bowl one Saturday, sat freezing in the end zone, and took pictures with my new Ansco camera during the all-important game with Harvard. But for the next four years that I lived there, I never walked even a few blocks further west, to what we called “Westville.” That was a different boundary, a boundary that still holds, though my eyes see it a bit differently today. That was where the “rich folks” lived. It was where I did not belong. I knew this without going there. Somehow I absorbed through my integument that I would not be welcome there. Even further west than that were the country clubs, (like Grassy Hills, where the reunion banquet was held in Orange). I would listen to the dismissive voices of my mother and father talking about the opulence of these places. This was where the wealthy Jews, who were not welcome in the goyishe clubs, would gather and lord it over their poorer relatives. Today the dilapidated housing of West Chapel Street ends with the marsh, a few houses from where I lived. Where houses take up again, on the other side of the Bowl, they are what might be termed “middle class” today — the disappearing section of the working class that each candidate appeals to when he or she decries raising taxes on “the middle class.” The wealth of corporate America has penetrated downtown, around the village green, and surrounding the historic 3 churches on the green, butting up against the Yale buildings that dominate the center of town, making New Haven appear a vibrant community. A Barnes & Noble has taken over/displaced the venerable Yale Co-op. These are not the streets I walked with my mother, to visit the communist-sympathizer dentist who fixed her dentures at a price she could afford to pay. These are not the streets to which my family escaped to have a rare night out at the Chinese restaurant — the first floor joint called the Chungking, where my father always ordered “subgum chow mein” and my mother chicken chow mein for 95 cents each; or, if we were feeling ritzy, the Far East across the street, on the second floor, a large room with fancier waiters, where sitting at a window table commanded a view of the bustling street below. I began this exploration with a hidden premise: that I (we) have become what I (we) have because of the leap taken by humanity all across the globe, but typified by the Hopewell peoples of Southern Ohio somewhere around one thousand years ago. The leap from a cooperative society came about to correspond to an economic revolution happening independently of the will of the individuals transformed by it. That revolution is the fundamental turning point that led to Hiroshima and the Hubble telescope, with all the ambiguity and potentiality that implies. The ambiguity and potentiality convinces me to obsess over antagonism and identity. I’m trying to find out who I am. There is an old turn of phrase that answers the question “Where do you come from”? by answering “My people are from Vilna.” But a Lakota saying has it that “We are all related.” In part this search for identity transcends the narrow meaning of that word, embraces the universal, claims a heritage in the species wherever it is. In part the search also recognizes divisions and walls that arose (in the mound building areas of North America) only about 1000 years ago, hence recognizes an identity in a common group of propertyless in all social formations, rejects the formulation that all men are my brothers. How we are “all” related is not the same quest as trying to understand the gulf that separates me from early humans, where class divisions do not yet exist. Yet it is connected. Now I want to find out how to leap the chasm that is opening again, but not to go back to what once was. I want to understand the emergence from the chrysalis of classless society into agriculture, in order to understand the development of the cocoon called capitalism. That cocoon is disintegrating. Here’s the problem. The objective destruction of capitalist relations means the destruction of the value of the worker. Not that what the worker has produced is worthless, can’t be used. Instead, what the worker has produced contains less and less labor-power embedded within it. The use of the worker in production is eliminated, therefore his or her value (in terms of wages) is eliminated, and therefore she/he is unable to buy what is produced. This schism separating buyer from seller forces the question of distribution of the socially produced wealth — whether automobiles, health care or education — back to the forefront. It makes the distribution what is produced by the intricate web we call society something that should be organized on the basis of need rather than ability to pay. This transition converts the social product owned by capitalists to property owned by society. That means the revolution also forces what is now capital to figure out how to cross the same chasm that will end capitalism while maintaining private property. These are antagonistic interests. In the face of an objective movement to distribute goods and resources according to need, the only way to maintain the extortion of payment is by violence. In my book that is the new form of fascism. Who says, “We can’t go back”? Those who refuse to embrace a culture in which childhood death is frequent (and hence life span is short), in which the store of food, while normally abundant, is still insecure; in which peoples who strive to communicate with each other are severely limited. In a million different ways, the collective survival of our species as we exist today renounces, both consciously and unconsciously, going back to that kind of existence even with its advantages. Working more became a trade-off for the survival of increasing numbers in a way that facilitates the communicative (evolutionary) strengths of human socialization. But what about if we are at another nodal point, another chasm, and another revolutionary change that is objective is propelling the motion forward, independently of human will. A nodal point that offers choices about working for what we want and love. A vision of what is possible: a new kind of abundance, so different from early society, where childhood death is minimized, resources are conserved for all, and where the biological imperative of collective survival uses the gifts developed by cooperative human evolution. What is different at this juncture is that the experience of the last 10,000 years can be summed up consciously. While the corporate capitalist class does not do this, we can and must make decisions that will assist our surviving the leap. Or we can abrogate our historic responsibility. If we have learned anything from the motion of the last 10,000 years, it should reflect how classes emerge, take control, and preserve their interests in a changing world. This was true in the leap from Hopewell to Fort Ancient, from hunter to cultivator. It was true at the time of the leap from agriculture to industry in the Civil War. 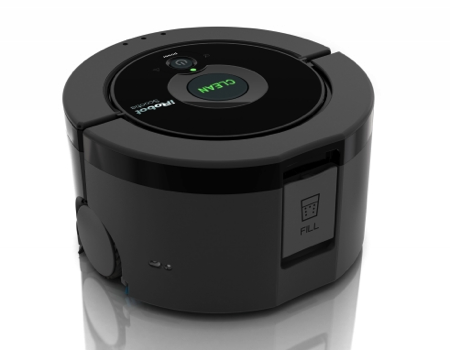 What class is emerging now that is the special product of the revolution we are undergoing? What is required to maintain the infrastructures we have built? Libraries have been destroyed in the past, accumulated knowledge torched. Yet humans have rebounded again and again. What is to say that the conversion to digital libraries will not again lead to the destruction of those examples of accumulated knowledge? Are ethereal libraries more fragile than those “brick and mortar” libraries that preceded the digital? Who has the most interest in seeing this accumulated knowledge generalized, preserved, augmented so that all can benefit? Without a doubt, the class in power today has demonstrated that it can destroy the capacity of humans to survive. While it strives to maintain its control of private property, the corporate class has embarked on a suicidal course for our species. As the corporations continue to play havoc with the ecological and political environment, the special product of the new economic revolution is a class that is moving in the direction of permanent separation from employment under capitalism. This vast majority of human beings is the only group who can be educated for and trusted with the stewardship of — rather partnership with — the earth.